A distant Erbig cousin of mine contacted a few weeks ago to gather info on the family and give me info on her branch. I love it when distant cousins get in touch to trade family facts. So while adding her some of the info she gave me on my tree on ancestry.com, I came across an interesting tidbit of information. It’s definitely them because it’s Robert “Jr” and also has the right names of their wives. I just love finding these odd little facts about the family. 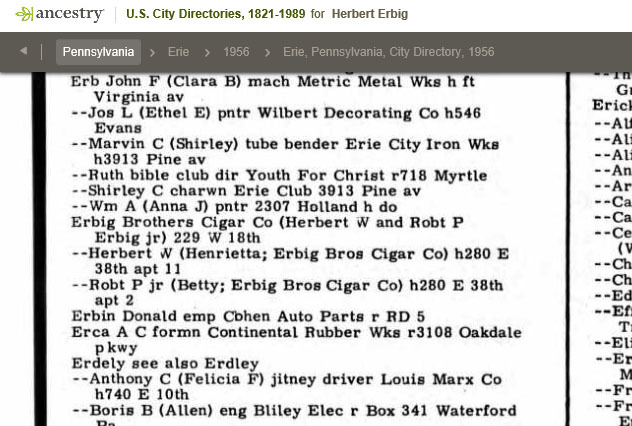 They show up in the 1957 Erie PA city directory but nothing after that. I think they moved back to Jersey City so I’ll assume the business didn’t pan out as they’d hoped. Still, it makes you wonder what got it in their heads to move to PA and start a cigar company??? It’s been a long time since I last posted on this blog. Sorry about that. I got majorly sidetracked with a few things. Writing my novels is a big one. I also had surgery a few months ago and it’s taken me a while to get back into the swing of things. So anyone from the Hopkinton RI area recognize this house?? 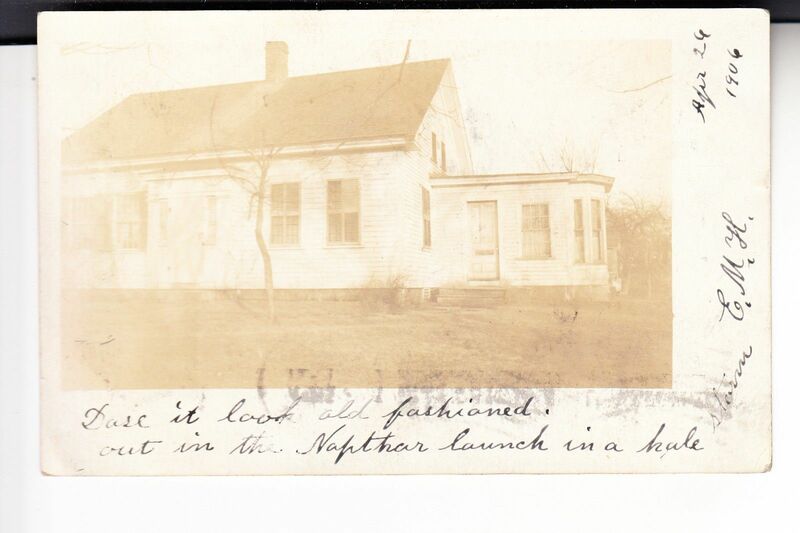 I don’t know anything about the house, but found this postcard for sale on EBAY this morning. It’s dated April 26, 1906 and it looks to say “Does it look old fashioned Out in the Napthar Launch in a hale storm E.M.H. I googled “Napthar Launch” and found this on Wikipedia: A naphtha launch, sometimes called a “vapor launch”, was a small motor launch, powered by a naphtha engine. They were a particularly American design, brought into being by a local law that made it impractical to use a steam launch for private use. But whatever it is, it’s part of Hopkinton’s past, so I throw it out there into cyber space to see if the house looks familiar to anyone in the area. Just trying to preserve some of the town’s history.